The electric wiring and system of your Alfa Romeo sometimes causes problems. When the battery is dead or almost, a cheap and reliable instrument will help you to prevent it from happening again. The ammeter is a reasonable investment, since it will tell the driver instantly what is going on with the battery. In fact, it will tell you how much electricity the alternator transports to the battery, or even worse, if the electricity is draining your the battery. When the gauge is pointing at zero or preferably somewhat in the positive sector you have an indication that everything is OK. When the needle turns over to the negative sector, you are most likely to end up with a dead battery and it's time to check the alternator and the electrical system. Besides, the ammeter will tell you how far the battery will last before it is completely dead. If your battery has a 60 AH and your ammeter is showing negative 10 am, you might probably have some five to six hours to go. Most ammeters indicate +/- 50 A and are low-priced. You will also need some cable and contacts. Please note, that the cable must be dimensioned for 30-40 A, so get a solid and thick one or you might end up with a shortcut. 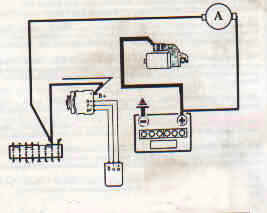 When you connect the alternator/generator, control (regulator) box and battery, check the wiring diagrams for your model. Always disconnect the battery before tampering with the wires! 1750 GT Veloce and Spider Veloce have the B+ from the alternator going direct to the + on the battery. From the battery there is a most thick cable to the starter. This cable is then connected to the fuse box and the main electric system. 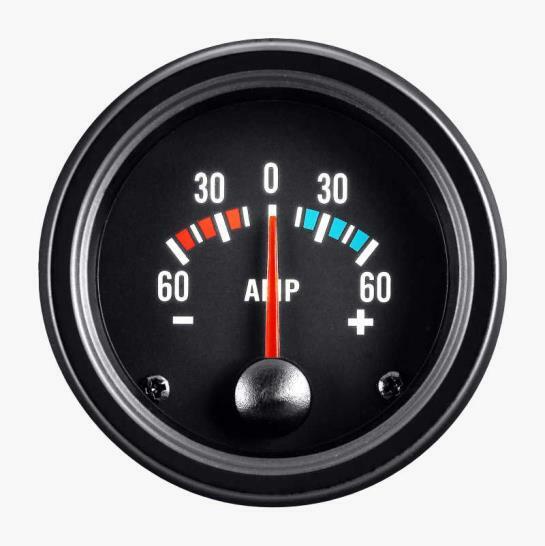 To get the ammeter to tell you everything about your electrical system, you will have to make a minor modification. 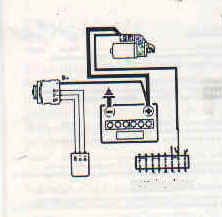 Disconnect the cable from the alternator B+ and the battery and replace it with a longer one and connect this to the fuse box and the original (red) cable. 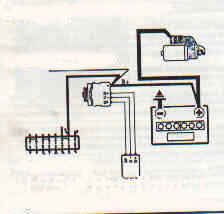 Then connect the ammeter to the cable from the starter to the fuse box. 1750 Berlina etc. Slightly modifications needed. As usual, the B+ from the alternator leads direct to the + on the battery. 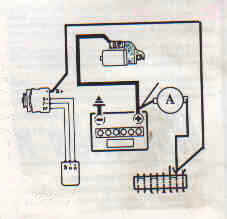 The fuse box is supplied from the B+ on the alternator and I have modified this as shown. 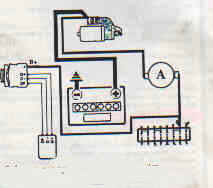 Some GTV cars in the 105-series has the same type of wiring diagram. 2000 Berlina etc. The horn has its own cable, an Italian specialty. Whatever happens, blow your horn and be happy. 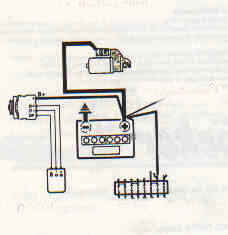 The proposed wiring does not register the horn consumption on the ammeter. No need to overdo it. 1600 Duetto and Giulas with generator (dynamo). The cars with the older types of generators perhaps need a better supervising of the control box. All electricity goes through the control box on cars with generators, which makes the wiring easy. Finally, where do you place the instrument? 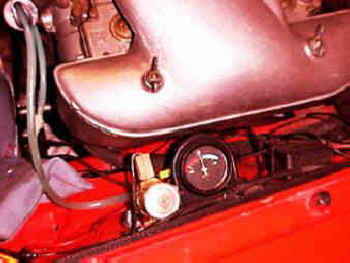 Well, since I do not want to spoil the original interior of my Roundtail, I have placed the ammeter in the engine bay where it is easy to read when I check the engine. Good luck!